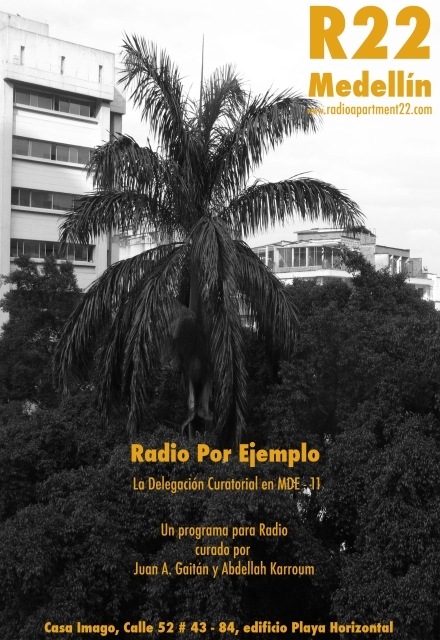 L’appartement 22’s participation in MDE 11* is effected through Radio 22, a web radio station that focuses on socially and politically engaged forms of cultural production. 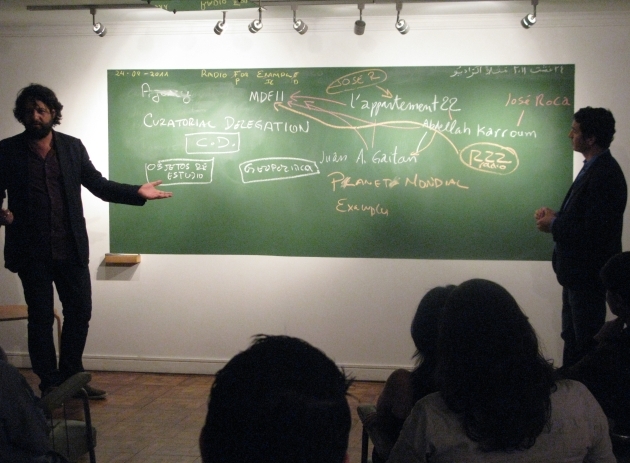 Responding to the invitation to take part in the program of guest spaces (espacios anfitriones) of MDE 11, the members of this curatorial delegation, Juan A. Gaitan and Abdellah Karroum, have established a temporary recording studio at Casa Imago, where they will be conducting a series of dialogues and interviews aimed at exploring the ways in which individuals engage with notions of the collective and operate within institutional frameworks. 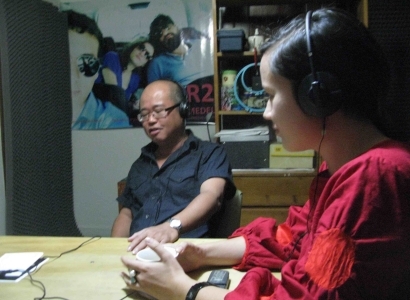 L’appartement 22’s participation in MDE 11** is effected through the project Planet Mondial and R22 radio, a web radio station that focuses on socially and politically engaged forms of cultural production. Responding to the invitation to take part in the program of guest spaces (espacios anfitriones) of MDE 11, the members of this curatorial delegation, Juan A. Gaitán and Abdellah Karroum, have established a temporary recording studio at Casa Imago, where they will be conducting a series of dialogues and interviews aimed at exploring the ways in which individuals engage with notions of the collective and operate within institutional frameworks. Radio For Example*** This project assumes radio as format for exploring content outside of the technical, social and political requirements of the image and the object. Privileging the active role of the listener in the construction of knowledge, R22 radio documents a series of discussions carried out in both Morocco and Colombia, through live engagement with these specific social, geographic and political environments. 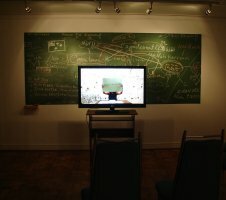 The concept of a Curatorial Delegation evokes the speed and distractedness with which the field of art engages with politics today, often treating social conditions as subjects of or for a spectacle, extracting content, as one extracts essence from flowers, granting cultural practices the stamp of authenticity, and guaranteeing global recognition. The Curatorial Delegation aims to translate and propose more intuitive and methodical forms of engagement with available or invented spaces, suggesting ways to establish meaningful dialogue, research, production, and communication (exploration, editing, and publishing). The Curatorial Delegation operates by deploying different tools for collecting and sharing content, functioning outside of the conventional formats for conducting research and presenting forms of cultural expression. Participants : Artists working collectively. Participants : Curators working between research and programmatic frameworks. 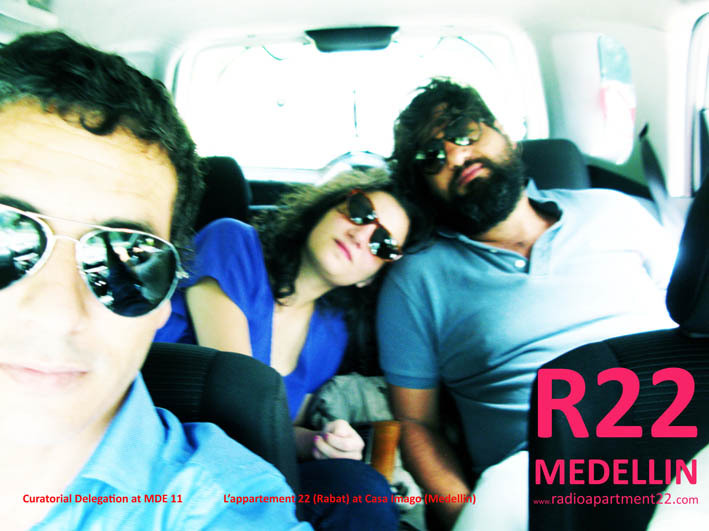 LISTEN TO R22-Medellin program here. * Juan A. Gaitán is a curator and writer based in Rotterdam, the Netherlands. Abdellah Karroum is an independent curator based in Rabat, founder of L’appartement22. ** MDE 11 is curated by Nuria Enguita Mayo, Eva Grinstein, Bill Kelley Jr., and Conrado Uribe.